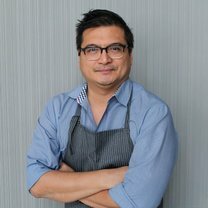 Tien Ho is the Global Vice President of Culinary and Hospitality at Whole Foods Market. Prior to his tenure at Morgans Hotel Group, he held chef and partner positions at a number of prestigious, cutting-edge restaurant brands in New York City, including Little Wisco, Momofuku, Ssam Bar and Má Pêche. "This blue cornbread and pickle plate is insanely delicious! @olamaieaustin"
"Apple, sorrel and goats curd. This is one of the best things I've eaten in a long time." "Wow. One of the best guinea hen terrine ever." "Zuni roasted chicken. A very special lunch."